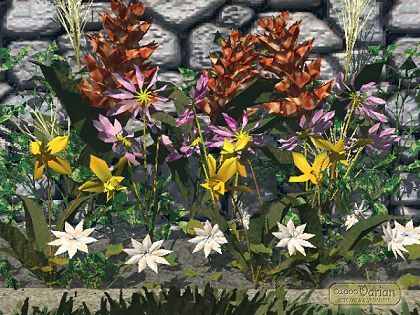 All the plants in this image were designed in PlantStudio then exported as DXF. The scene was composed and rendered using Vue d'Esprit. Illustrated plants: Tribellane, CornSilkie, Emperor's Crown, Shaeffer Daisy, Sunny Jonquil, Star Daisy, Fat Grass.